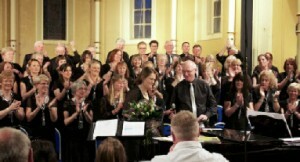 The Ashbourne Singers’ summer concert on the first Sunday of the Arts Festival was a sell-out, with St John’s Church packed to the doors for this popular local community choir. Led by musical director, Linda Perry Smith, the choir entertained with old and new favourites from the world of film and television, with a programme for all tastes from Irving Berlin to Karl Jenkins. Assistant musical director Michael Halls conducted a spirited rendition of “Men of Harlech” sung by the gentlemen of the choir and Linda responded by leading the ladies in “I could have danced all night” from My Fair Lady. A rousing finale of Rodgers & Hammerstein classics featuring soloists from the choir and ending with “You’ll never walk alone” from Carousel brought the audience to their feet and led to a well-deserved encore. By popular choice, this was a repeat of the poignant Leonard Cohen classic “Hallelujah”, the opening solo being taken by tenor Paul Cook. In addition to choir items, Liz Grime and Ray Taylor sang Cole Porter’s “True Love” accompanied by Ann Pepper on the piano, soprano Sue Tansey performed “Stranger in Paradise” and Rob Morton gave an excellent rendition of “Singing in the Rain”, complete with umbrella, much to the enjoyment of the audience. 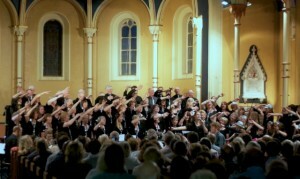 A chamber group from the choir performed “Windmills of your Mind” to such effect that a member of the audience was later heard to remark that this had “sent shivers up his spine”. However, this talented group has more strings to its bow than just singing, as was clearly evidenced by members Lesley Bentley playing acoustic guitar in “Hallelujah” and Jane Gladdish on the recorder in Karl Jenkins’ stirring “Adiemus”. The concert also showcased the talents of local young musician Tom Bland, who provided percussion and vibraphone accompaniment to great effect alongside pianist Ray Taylor. Since its formation in September 2007, the Ashbourne Singers has grown in both numbers and stature. 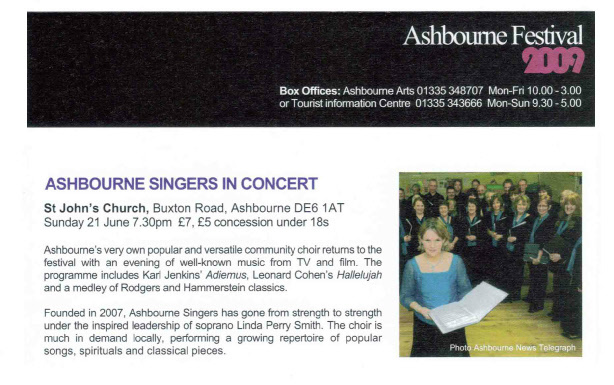 The concert on Sunday night demonstrated how far the choir has come in musicianship and scope of repertoire in a very short time and the group is becoming increasingly well-known in the Ashbourne area and beyond.